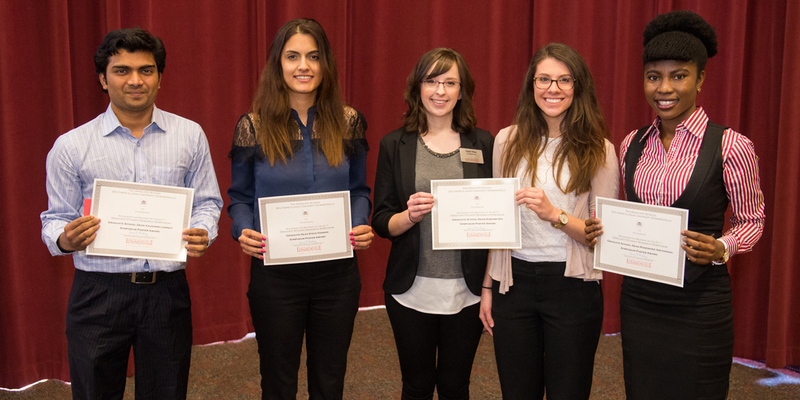 Research Grants for Research Doctoral Students (RGRDS) awards small grants on a competitive basis to support research/projects initiated and conducted by students of the SIUE EdD and the co-operative PhD programs to enhance their academic progress. Although faculty advisors oversee the research, the purpose of this program is to support the research of doctoral students. Previous RGRDS recipients are ineligible for a second grant. Applicants may request up to $1,000; total award money available is $15,000 annually. Awards may be granted for the full amount requested or for a lesser amount, depending upon availability of funds and the appropriateness of the amount requested. Meritorious applications are funded up to the limits of the RGRDS funds available for each year. Students must maintain good academic standing and enrollment during the tenure of the grant. Students may be allowed up to one year to expend grant funds. Awards are for future expenditures only. Recipients cannot request funds to reimburse money spent before the RGRDS is awarded. Funds are distributed to the student's department of study for their expenditures. Purchases related to this award may begin when students have received their award notification and are to be charged to your department or school's ICR account, after which the Graduate School will reimburse the ICR account. A single invoice of the itemized equipment expenses are to be sent to Tammy Smart, Campus Box 1046. Make sure to note that it is for RGRDS. All funds awarded must be expended by June 30th of the following calendar year or are forfeited. Prior approval of changes to the budget must be obtained from Susan Morgan, Associate Dean, Graduate School, smorgan@siue.edu. Applications are due in Academic Works by July 1st or next business day. Proposals that are not uploaded into Academic Works by the established deadline are not reviewed for funding. Proposals are to be approved and signed by the student’s major advisor and the department chair. The student submits the Application through the online Academic Works scholarship system by July 1 or next business day. Proposals must include the cover page with proper signatures, a brief narrative and a budget form. Narratives should be double-spaced and must not exceed five pages, exclusive of the cover page and budget form. The narrative must be written such that it can be understood by an educated lay audience. **Applicants are advised to carefully follow the prescribed format. You must use the required cover sheet and budget sheet and the narrative must not exceed five pages. If the submission is not in this format, it will not be considered for review. Provide a short narrative justifying the budget. Itemize and detail the budget on the budget request form. The budget request should not exceed $1,000. Supply a cost for each item requested for commodities, travel, contractual services and equipment. See “Allowable Costs” for examples of appropriate and inappropriate requests. All requested items should be clearly related to the project that is to be conducted. You may not request funds to reimburse departments or other entities for money spent on this project prior to the receipt of the award. The proposal packet will include the following documents. Submit documents, in a single file, through Academic Works. Note: The proposal packet must include the following PDF documents: cover page, budget form and narrative. You may use the RGRDS Checklist in preparing your proposal. Follow these guidelines when preparing the budget form and narrative. List and justify each budget item. Travel for the purpose of gathering data which could not be obtained otherwise: mileage, commercial fare, lodging and per diem. *Please note that any equipment purchased with the RGRDS grant funding is the property of Southern Illinois University Edwardsville. The purchases must be returned to your department once you graduate and are no longer affiliated with the University. Funds will be transferred to an ICR account. It is the responsibility of the individual researcher to expend funds only for approved items. The unit and major advisor are responsible for overseeing the appropriate use of the funds in a timely manner.